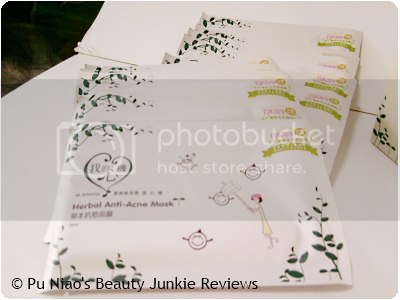 My Scheming: Herbal Anti-Acne Mask: The mask contains orris and green tea extracts that can balance oil secretion and relieve oily skin problems in teens. Allantoin, Hamamelis and Chamomile extracts in the mask can relieve skin problems, reduce inflammation and tighten pores, moisturizes the skin, improves skin quality and prevents an allergic reaction. 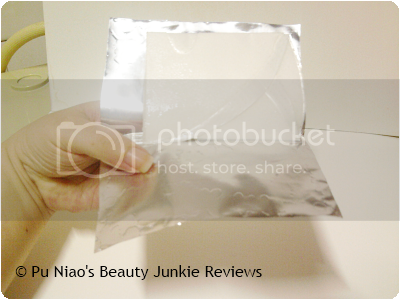 Here's a look at inside the sachet itself. Anyways, I previously do have pimples popping up, but it's mostly 1 or 2 that showed up unexpectantly without warning and yet thankfully, managed to subside rather quick too. Until a week ago, I got all 3 of them around my chin area. I figured those 3 pimples could have been BFF since this is practically the first time I had 3 all at the same time. Oh no, I did wash my face daily, twice as a matter of fact, once in the morning when I crawled out of bed and another one more time before I go to bed and start my "Oinking" session. And no, I didn't really sleep that late since I wasn't playing any MMO games in the middle of the night and heck, I didn't even watch any TV too. Sleep is too important!! So, I am guessing it could have been the weather, environment or something I ate that aggravated all 3 into making an un-announced arrival. 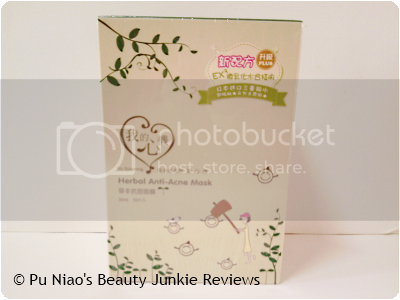 And lucky me, I had this box of Herbal Anti-Acne Mask at hand to help solve the problem. As most of you are aware of, my pimples tend to be the stubborn type that shows up, lingers on my face for as long as it possibly can while causing me pain, anguish and agony whenever I accidentally brushed it before it finally decides to go away. 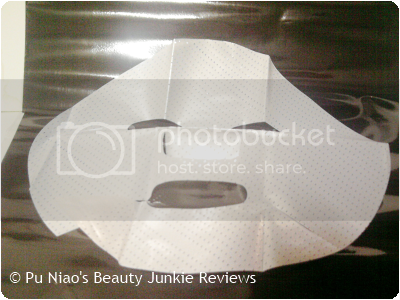 And before that "pain, anguish and agony" chapter had even started, I used this mask for close to 4 days in a row. 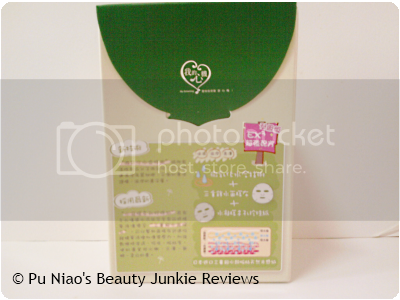 According to what I read on the box packaging, this Herbal Anti-Acne Mask contains orris and green tea extracts which balances oil secretion, and the Allantoin, Hamamelis, and Chamomile extracts relieve skin problems, reduce pores and inflammation. And yes, I did moisturize every night before I sleep too. So, kinda baffles me where the excess sebum seemed to come from. Oh yes, I definitely do have the regular skin problems most people are suffering from. The only part of my face spared from pimples are actually my cheeks, no wonder people like to pinch them when they had the chance -_-"
As mentioned, I dutifully proceed with my usual facial cleansing regime every night, sometimes I switch around by doing those spreadable and peelable masks to lift away impurities and dead skin cells before applying this mask, so that my skin will be able to absorb the mask essence and do it's magic work on my poor "abused" skin. And not forgetting to mention that wonderful scent whenever I peeled open the sachet to get access to the mask, I just love it, it always manages to calm me down sufficiently enough for me to lay still and do nothing while the mask is doing it's work on my face. And after 4 laborious days of applying this mask every night, I am happy and ecstatic to announce that my pimples trio didn't look as "inflammed" a.k.a red as compared to before. Normally, it will be a large blot of angry looking sore spot where the pimple is, making the pimples really obvious on my face when I have to step out of the house. But after using this for 4 days, I didn't see any large red and angry red spots at all. It's as if the pimples themselves look more like mosquito bites than actual pimples. And remember in some of my previous posts on how I mentioned my pimples tend to take too long to decide whether it should ripen or go away? Well, by the 3rd day of using this Herbal Anti-Acne Mask, the pimples trio decided to ripen, to my surprise. I got rid of the pus via the not so recommended method, which is to pop them up manually. And I continued to use it on the 4th day, now those pimple trios are fast disappearing away into oblivion. And I believe I found another BFF in My Scheming masks, on top of the Milk Extract Brightening Mask and Deep Cleansing Pore Minizming Mask. This made it 3 BFFs I have found in the My Scheming mask range. VERDICT: Controlling naughty pimples trio, checked! WHERE TO REDEEM SAMPLE: So far, I haven't come across My Scheming giving this away for their Facebook contest. But hey, their other ranges are just as good too and they are always constantly having Facebook contests for their fans. So, why not check out My Scheming Facebook page at https://www.facebook.com/MySchemingSg? On top of that, My Scheming is having a contest called "12 Days to New Year Give-away" where one lucky winner will be chosen every day to bring home their awesome masks!! And the winners for my Christmas Giveaway are.. Monthly Topic #5: Let's Party!